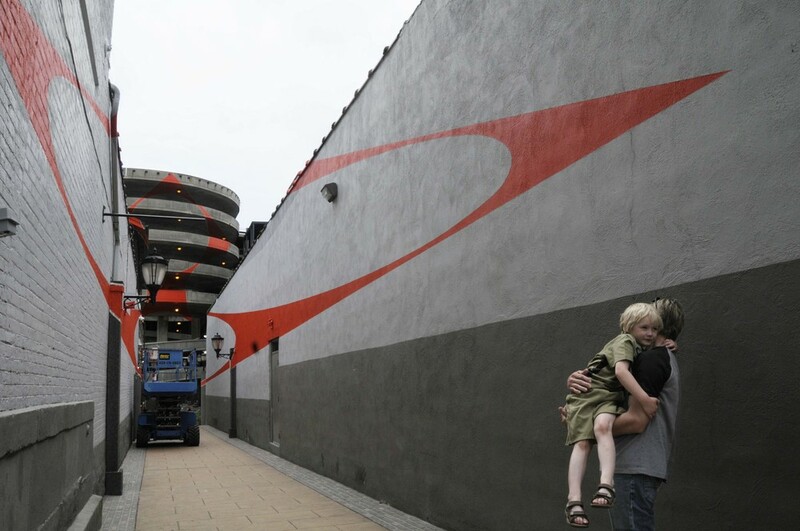 In 2010 Site Projects undertook its first permanent public art commission by the renowned Swiss artist Felice Varini. 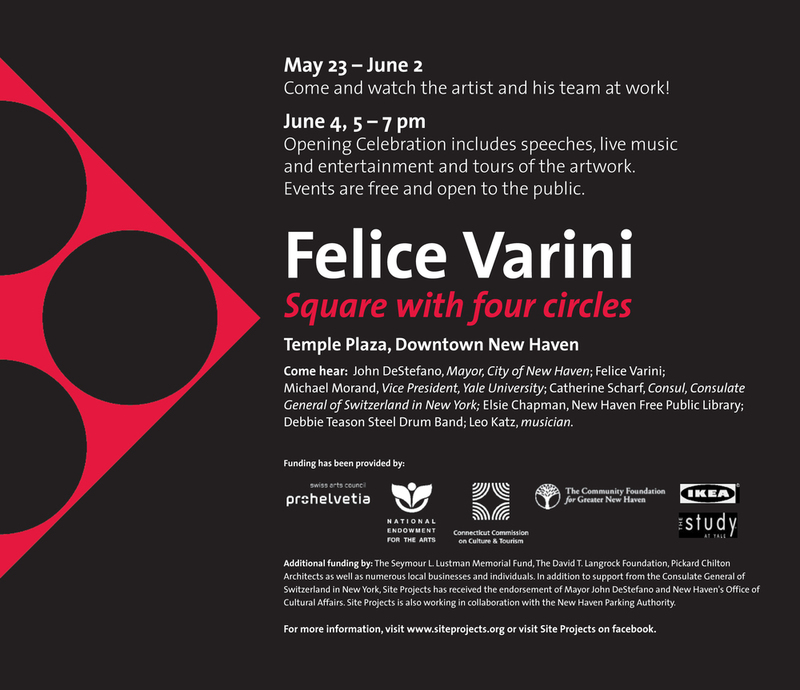 Square with four circles, a 110 ft tall, multi-dimensional wall painting, remains one of our most beloved and well-recognized commissions. 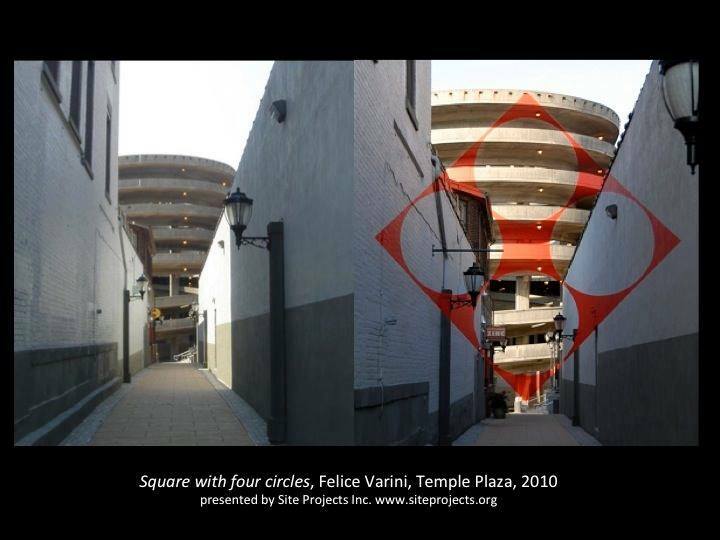 Installed in Temple Plaza in 2010, Square with four circles is Varini's first outdoor public artwork in the United States. Work on the execution of the artwork took place both at nighttime and during the day. 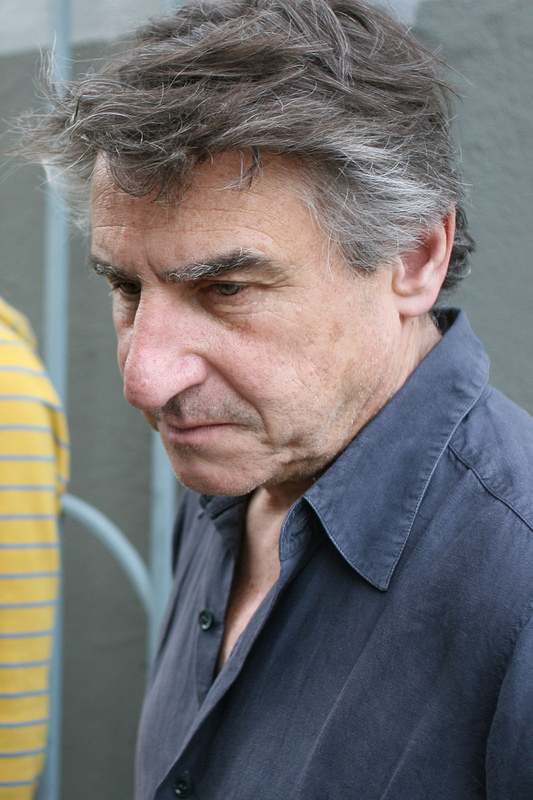 The installation was a performance piece in itself offering the public a unique opportunity to observe the artist's process and the evolution of his artwork. 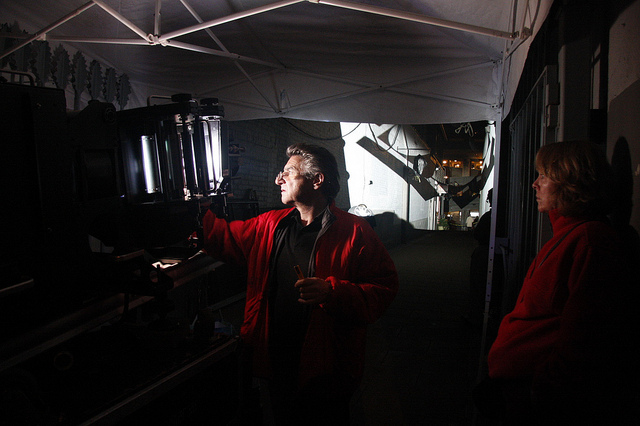 Beginning May 23rd, 2010 at night and using a large format, high intensity projector, Varini projected the design into the darkened site. 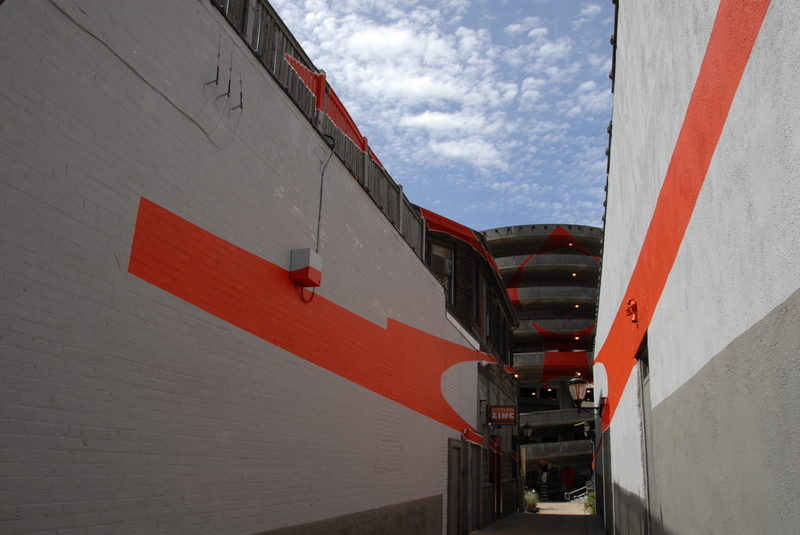 Once the outlines were drawn by the artist and his team, the daytime work of painting the mural began. Painting was completed in the following week and a half. The installation opened June 4th, 2010. The exhibition of the artwork is on view indefinitely. 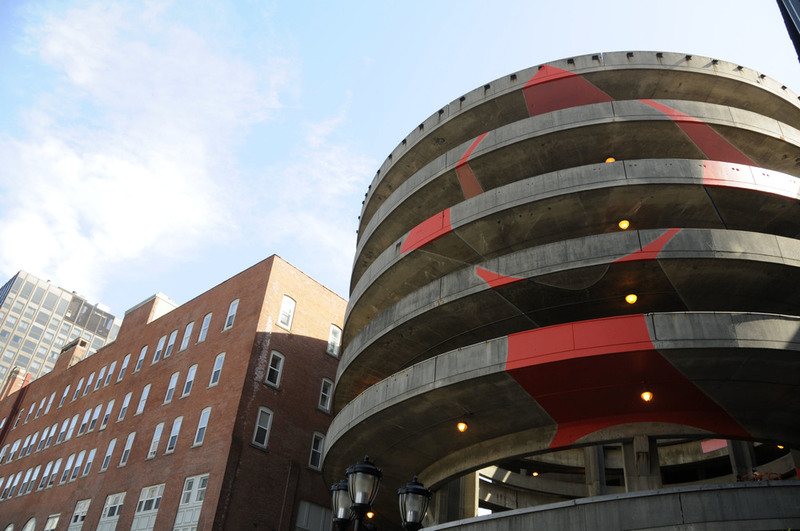 The site of Square with four circles includes the pedestrian passageway from Chapel Street into Temple Plaza and the exterior surfaces of the sculptural concrete exit ramp of the Crown Street garage. 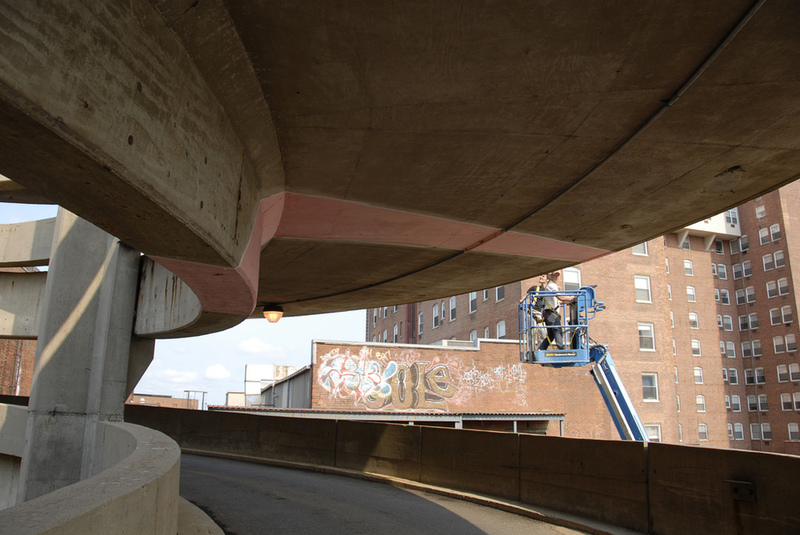 The site of the artwork is contiguous not only to New Haven Green but also to the Shubert Theater and Zinc restaurant. To see more photos - head to our Flickr page. Felice Varini was born in Locarno, Switzerland in 1952 and currently lives and works in Paris, France. Varini’s work plays with concepts of scale, proportion, and perception. While abstract and conceptual, Varini’s three-dimensional wall paintings are also concrete and material. 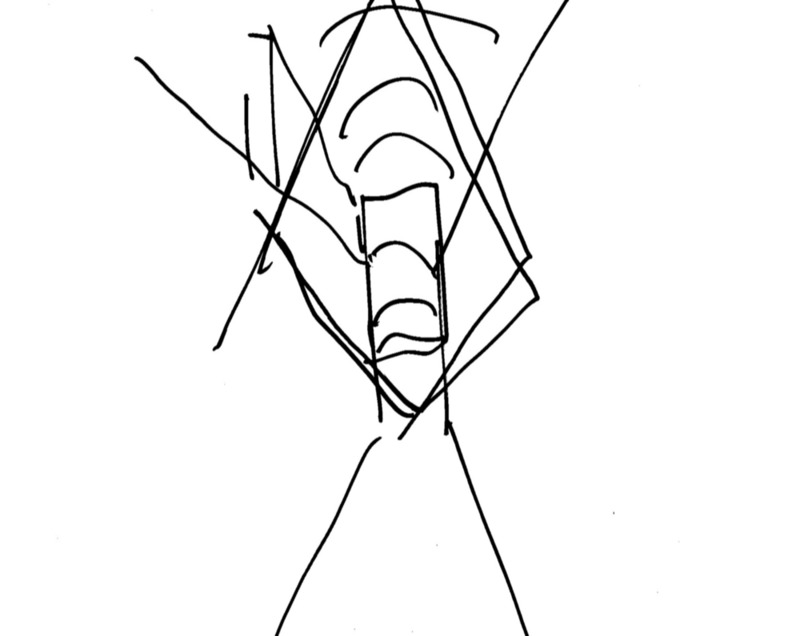 The viewer experiences them from within; as he/she moves through the architectural space which is the canvas, new discoveries are made at every step. Before making a painting, Felice Varini generally roams through the space noting its architecture, materials, history and function. From this spatial data and in reference to the last piece he produced, he designates a specific vantage point for viewing, from which his intervention takes shape. The vantage point is carefully chosen: it is generally situated at his eye level and located preferably along a well-traveled route, for instance an opening between one room and another, or a clearing, or a landing... He then projects the form devised for the particular space onto its surfaces from the vantage point, then traces and paints. Unlike the majority of artists, who work within strictly defined limits, Varini uses every dimension. By creating work that is not portable and cannot easily be contained, he sidesteps the temptation to make a cult object of the artwork. For him the “art object” has become a rearguard concept. Indeed he has neither a collection to sell, nor paintings to store. “I’m entirely free from material and logistical constraints. Like a musician performing on stage, I ask for a fee from whoever is commissioning the work, whether a gallery, a collector, a town council or an arts centre. This does not prevent my works from being sold on. Once I make a work it can be removed and remade in a different place, as long as certain guidance is followed. I write a description for each work, describing its specifications, and you can remake it in another space if you follow the exact instructions for the shapes, sizes, relation to each other, and relation to the space. The new space needs to have similar characteristics to the original one. The result will not be a new work, but rather a remake of the same work. I do not make an object and move it, but I move the concept, and can remake it in the new space, in the same way that there is a written play and a theatre company can stage it in a few different theatres."